Maciej Wojtkowski is worldwide-renowned scientist active in the field of biomedical imaging. His research interests include optical coherence imaging and microscopy applied to biomedical imaging. He has had significant impact on the design and development of Fourier domain Optical Coherence Tomography (FdOCT) technique, commonly used in ophthalmic and cardiologic diagnosis. The FdOCT method and instrument for in vivo retinal imaging was firstly developed by Prof. Wojtkowski and his colleagues from the Medical Physics Group at Nicolaus Copernicus University Poland in 2001. 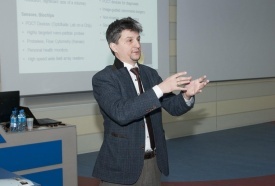 Prof. Wojtkowski has also contributed to the development and construction of three clinical prototypes of high speed and high resolution OCT instruments, which were immediately applied for diagnostics in ophthalmology clinics: in Collegium Medicum in Bydgoszcz (Poland), New England Eye Center, Boston (USA), and University of Pittsburgh Medical Center (USA). Professor Wojtkowski is an author of more than 160 publications, including 90 full papers in peer reviewed journals. During his academic career Maciej Wojtkowski held short internships in Vienna University and University of Kent. He also worked for two years as postdoctoral fellow in joint project of Massachusetts Institute of Technology and New England Eye Center. Professor Wojtkowski led his own research team (20 group members) of Optical Biomedical Imaging Group at Nicolaus Copernicus University, Toruń (Poland). Wojtkowski group was interested in application of optics to biology and medicine, especially dark field Optical Coherence Microscopy dfOCM applied to imaging of rodent brain, measurements of corneal biomechanics or noninvasive imaging of microvasculature. Currently, Professor Wojtkowski - as the ERA Chair holder in the CREATE project - is responsible for the establishment of the Department of Physical Chemistry of Biological Systems at IPC and building new IPC specialization – chemistry inspired by biology.